Mark Lougheed has joined the en- facility and is a licensed professional gineering team at Willard Marine, Inc. engineer in the state of Florida. Nick Pope has been promoted to ect management to Willard Marine. Dynamics Group as an Engineering Diesel’s Chesapeake, VA location. 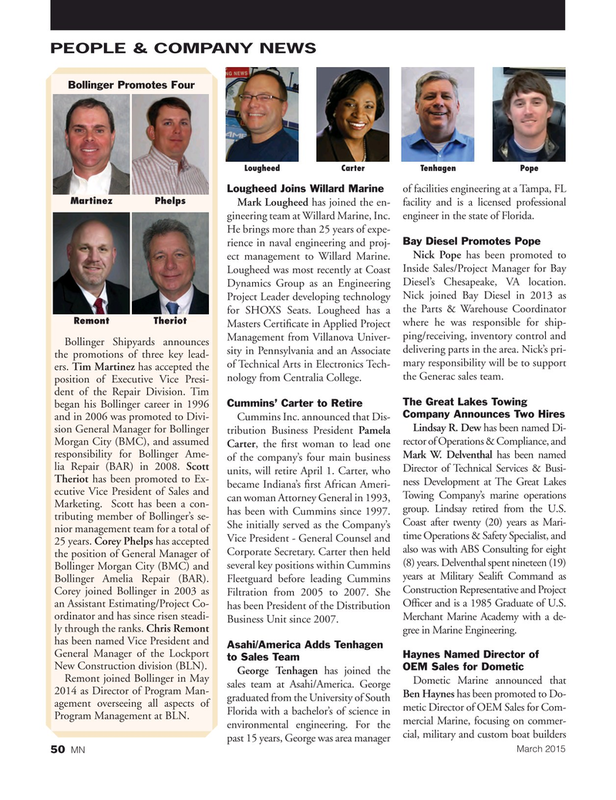 Bollinger Shipyards announces Management from Villanova Univer- sity in Pennsylvania and an Associate delivering parts in the area. Nick’s pri- the promotions of three key lead- mary responsibility will be to support of Technical Arts in Electronics Tech- ers. Tim Martinez has accepted the the Generac sales team. Business Unit since 2007. ly through the ranks. Chris Remont gree in Marine Engineering.